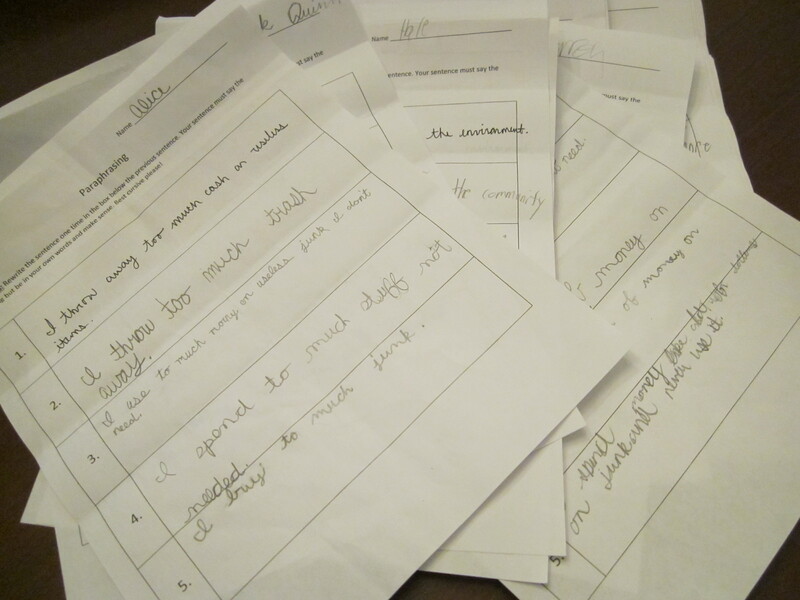 There are many reasons paraphrasing is important for school aged children. It enhances vocabulary. It forces students to change ideas into their own words, which confirms understanding. It builds a stronger memory when words have been changed into your own personal version. My students practiced paraphrasing this fall, so we would have a foundation for notetaking when we start the big research project in January. Paraphrased words must be correct and make sense. Paraphrased words must be your own version (in your voice). Paraphrased words must say the same thing as the original phrase. If your child is having trouble with paraphrasing and notetaking, start by paraphrasing single words. Look at key words in a paragraph or reading passage and replace the “important” word with a synonym or group of words that will mean the same thing as the original. This activity has the added bonus of building a student’s vocabulary bank. Finally, break a paragraph into the main idea and 3-4 key details. Make a list of the main idea and details (this will look similar to an outline). 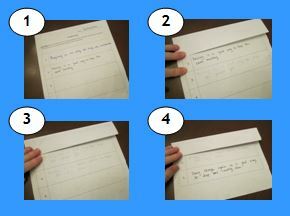 Now, ask the student to convert the list into sentences using their own words. Not every word can be changed. Proper names will stay the same when you paraphrase. Susan can stay Susan. Empire State Building can stay Empire State Building. Little words like a, an, and the might not change either. You will not always replace one word with one word. Paraphrasing larger groups of words and sentences do not require that you have a new sentence with the exact same amount of words as the original, nor do the ideas have to be in the same order. 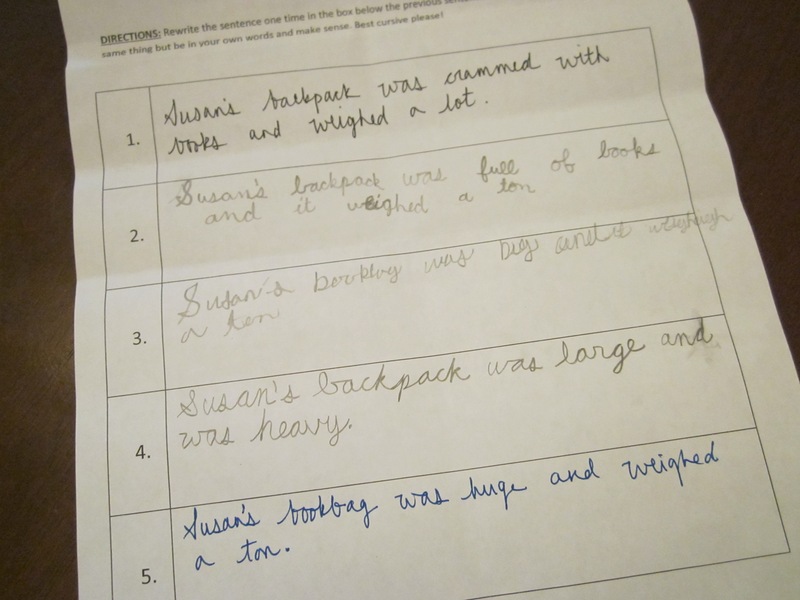 Susan’s backpack was crammed with books and weighed a lot can become Susan’s heavy school bag held many books. After my class went through the steps of paraphrasing words, phrases, and whole paragraphs, we reviewed by playing a written version of the telephone game. I pre-wrote detailed sentences in the first row of about 8 Paraphrasing Sentences Charts and made enough copies for a class set. I gave each student this Paraphrasing Sentences Chart with the starter sentence. The student paraphrased the sentence that appeared in the first row of the chart and then folded the paper, so only the newly written sentence appeared (row 2). The students traded papers and repeated the procedure. We traded papers 4 times, and at the end, unfolded the papers to read each version of the sentence to see if the message from the first sentence stayed the same as the words written in the final sentence. Sometimes the message from the original sentence stayed the same; sometimes it didn’t– just like the real telephone game. We had fun reviewing the changes in the sentences from one line to the next, and handwriting played a big factor in whether the sentence stayed on track! Paraphrasing is an important part of the Smarter Balance tests related to Common Core. It’s great to read how you are instilling this skill at lower levels, which makes my job easier at the 9-12 grades. It’s nice to know that these kinds of skills really are useful to high school folks. I am sure you get a wide range of abilities when the kids hit you with some who can take notes and summarize critical information well, and some who have no idea what to do! As Common Core becomes more common the skill levels are improving. This year’s seniors didn’t get much in the way of CC instruction, so I’m building the plane while trying to fly it! I’m trying to incorporate paraphrasing during our writing block and I find that it’s difficult for some of my upper elementary kiddos. Hopefully as the CCS are implemented, the kids will master it! I have better luck when I build “up” with students. Moving from one word to short phrases to sentences to blocks of texts seems to make it easier for my kids. Thanks for the comment! Play in the snow and go sledding! I am in SC– we never get to go sledding! I am jealous. We will begin studying the cell. We will be learning about MLK, Jr. in January. We will be learning about MLK, Jr.
My class will be doing research on ancient civilizations. Happy New Year! My classes will be reading The One and Only Ivan and citing text evidence. Thanks for a great blog hop! Does that book remind you of Charlotte’s Web? Thanks for hopping!